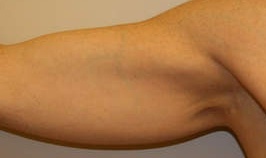 Brachioplasty or Arm lift is the removal of excess skin and fat in the upper arm. Dr. Sacks has written a chapter in a text-book on Body Contouring on this subject! In the minimally loose skin patients it is possible to keep the incision and thereby the eventual scar, confined to the armpit but these patients have no excess or minimal excess fat in the upper arm and very minimal loose skin. Normally the incision runs along the entire inner arm and into the armpit or axilla as well. Excess skin is removed inside the surgical pattern and liposuction can be performed at the same time. Swelling - This is only temporary and will resolve over a few days to a week. Bruising - This too is temporary and is helped by taking Arnica Montoya - an ancient herbal remedy, for a few days before the surgery and for a few days after the surgery as well. Also all blood thinning substances must be stopped a few weeks before the surgery. Infection - This is usually minimal and unlikely as Dr. Sacks at Arizona Cosmetic Surgery Phoenix, will have prescribed antibiotics for the patient starting the day before the surgery and continuing for about a week after the surgery. Scars - Depending on the patient's individual healing ability, the appearance of the scar and how noticeable it is will vary, but will never be invisible. Tightness - This is temporary and will subside after a few weeks. 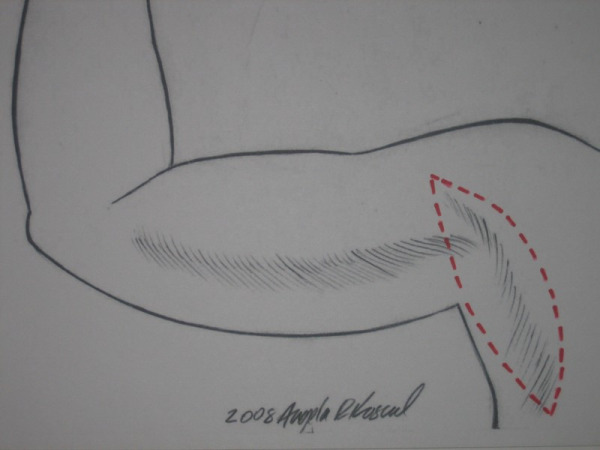 If there is tightening in the scar, a small surgical adjustment, called a Z-plasty may be performed by Dr. Sacks.